At TravelBank, we made reimbursements so fast employees get their money back before they have time to miss it. Adding your bank account is super easy and can be done from both the mobile app and the desktop. To add your bank account for rapid reimbursement from the mobile app, open the menu and tap View Profile next to your avatar. Scroll down and select Add to Receive Reimbursements. 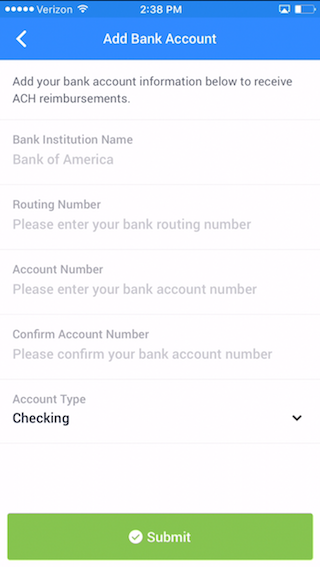 Enter your bank details, including Routing Number, Account Number, Bank Institution Name and Account Type, then tap the Submit button. To add your bank account via the desktop app, click View Profile > Add to Receive Reimbursements. Enter your bank name, routing number, account number, and account type, then click Submit. Your account will now be added to TravelBank so you can begin receiving reimbursements! Having trouble? Send us a note at success@travelbank.com and we will get back to you with additional instructions to ensure you can get reimbursed ASAP.